When hit TV show 13 Reasons Why debuted on Netflix on March 31, viewers quickly devoured the teen drama. Based on the 2007 novel of the same name by Jay Asher, it depicted the story of a Hannah Baker, girl who committed suicide and left 13 audio tapes for people in her life, explaining why she died. Public response to the show has been varied: some viewers praised it for openly discussing mental illness, while others found it triggering due to its graphic portrayals of suicide, sexual assault, gun violence and bullying. Several episodes include warnings, however some people don’t believe this is enough, prompting Netflix to include more. Despite this, it is likely a second season of the show is on the way. If you have yet to watch 13 Reasons Why, or know someone who is watching it, it’s essential you know what the series is about so you can make an educated decision about if you will watch it, who you will do this with and when this will happen. 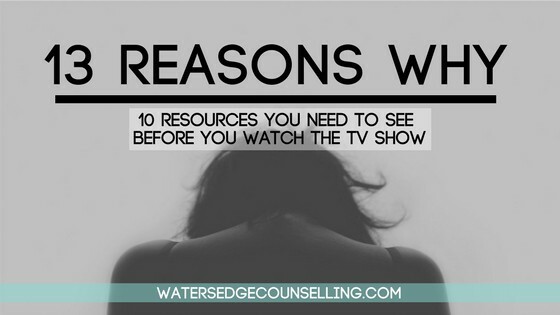 Here are 10 resources we found discussing the pros and cons of 13 Reasons Why. Take a look at each one and talk to a friend, mentor or colleague about how you will approach the series. By being educated about this pop culture phenomenon, you can better care for yourself and the people around you. A non-profit that presents hope and help to people struggling with depression, addiction, self-injury and thoughts of suicide, founder Jamie Tworkowski discussed the show in a recent blog. Expressing concerns about the way it vividly portrayed suicide and the negative connotations it aired about seeking professional help, they praise people who “put [their] recovery first” by making the choice not to watch it. After an increased amount of queries once the show aired, this Australian mental health service for young people released a PDF that clearly identifies the concerns people have raised about its content (eg. suggesting suicide is reasonable due to the ’13 reasons’). It also lists the research to support or dismiss each point, and suggests strategies to talk to young people about each topic. Dr Fiona Wagg a psychiatrist at Royal Hobart Hospital, discusses how parents can best approach their children and teens about the series. This piece by NY Mag is unique because it goes straight to the target audience of the TV show: teenagers. Revealing a variety of perspectives, you’ll find this enlightening as teens point out what they did and didn’t like about the series, and how it has impacted them individually, in their family and how its been received by the wider community. Mental health website The Mighty has published numerous articles on 13 Reasons Why. With blogs highlighting the impact it has on someone with PTSD and chronic illness, a parent’s point-of-view, how it has helped people find safety and overcome shame and even a piece where a young person discusses their regret upon watching it, this is an invaluable archive for personal responses to the show. This short interview with teen icon and producer Selena Gomez gives some insight into the purpose of the series. Series writer Nic Sheff wrote this exclusive piece for Vanity Fair, detailing the very personal reasons he took on the controversial TV show. While this is important reading, it is extremely descriptive and graphic as Sheff talks about his own suicide attempt. Read with care. This piece by the Guardian gives a fantastic oversight of the response from the Australian mental health community, as well as a more general overview on the impact of suicide in society. Keep an eye out for quotes by Lifeline Chief Executive Pete Shmigel, who explains why they believe 13 Reasons Why has gone ‘too far’ in their depiction of suicide. This extensive piece gives a thorough over view of the public’s response to 13 Reasons Why. Referencing the responses of mental health services across the world, the intentions of the show’s creative team and referring to appropriate statistics and research, if you’re looking for a single, overall piece to read, this is it. Also available on Netflix, this documentary accompanies the 13-part series and shows exclusive interviews with the cast, creators and mental health professionals, giving more context to the story. Please note that this documentary is rated MA15+ and could be triggering to viewers due to audio and visual content. Have you watched 13 Reasons Why and had a strong, emotional response to it? Are you concerned about a loved one who is watching the TV show? Call Colleen on 0434 337 245 or Duncan on 0434 331 243 for a FREE 10 minute consultation. To make an appointment, go to BOOK NOW and you will be able to access Watersedgecounselling’s online appointment diary.